Angry clashes erupted in the West Bank Thursday as the Middle East braced for violence over President Donald Trump's contentious decision to recognize Jerusalem as the capital of Israel. 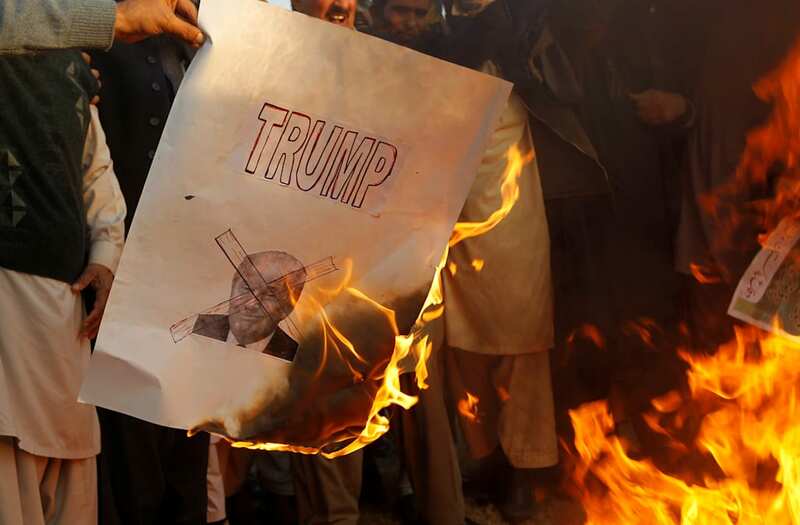 U.S. embassies around the world were on alert for protests after the announcement, which sparked uproar among world leaders and upended decades of American policy. In Bethlehem, Israeli police fired tear gas to disperse demonstrators while Palestinians set tires alight and threw rocks in Ramallah. In Jerusalem, about 20 chanting protesters at the historic Damascus Gate were ordered to leave by police. There were no immediate reports of injuries. But Friday, the Muslim holy day, could provide an important test when Palestinians gather for weekly mass prayers. Powerful Palestinian Islamist group Hamas called for a new intifada — or uprising — against Israel while a prominent Iraqi militia Harakat Hezbollah al-Nujaba, said Trump’s “stupid decision” could become a "legitimate reason" to attack U.S. forces in Iraq. American flags were burned at protests outside the U.S. Consulate in Istanbul and in Cairo and Gaza City late Wednesday, while Iraq on Thursday summoned the U.S. ambassador in Baghdad over the issue. The State Department updated its “worldwide caution” advice late Wednesday and sent a internal cable deferring non-essential travel to Israel, Jerusalem and the West Bank through Dec. 20, officials told NBC News. The U.S. Embassy in Jordan said it had "temporarily suspended routine public services" and that "all embassy travel outside Amman, both official and personal, has been prohibited until further notice." In the Baqaa refugee camp on Amman's outskirts, hundreds of Palestinians roamed the streets overnight, denouncing Trump and urging Jordan to scrap its 1994 peace treaty with Israel. "Down with America ... America is the mother of terror," they chanted. Turkey said America had dropped a grenade in the Middle East. "The United States has pulled the pin on a bomb ready to blow in the region," Prime Minister Binali Yildirim told a conference in Ankara. Trump's announcement also put in motion a move of the U.S. embassy to the holy city from Tel Aviv — a process that aides have said could take several years. It marked follow-through by Trump on a major campaign promise he'd made that had been closely followed by Israel and by evangelical Christians in the U.S. Ahead of the announcement, Defense Secretary James Mattis and Secretary of State Rex Tillerson had voiced concerns about the threat it would create for American personnel in the region. Since the 1979 Camp David Accords, U.S. presidents have refused to recognize Jerusalem as the capital of Israel or move the U.S. embassy. The U.S. approach has been that Jerusalem's status should be negotiated between the Israelis and Palestinians. Lebanese militant group Hezbollah said the move closed all paths to negotiations. Hassan Fadlallah, spokesman for the group's lawmakers, said the only way for Arabs to restore their rights was now through armed "resistance." Tillerson defended Trump's move, saying it reflected a longstanding reality. Speaking on the sidelines of an Organization for Security and Cooperation in Europe conference in Vienna, he said the U.S. would still support a two-state solution to the Israeli-Palestinian conflict "if that's the desire of the two parties." Israel’s security force, the IDF, sent reinforcements to Judea and Samaria as part of “readiness to possible developments” in response to the decision.